Like I mentioned in the last post, the quality on these isn’t good at all – the blushes are amazingly vibrant and pigmented in real life and these swatches don’t do them justice, but I figured these could at least help you get an idea of what shades you might like or dislike. Thrust is a bright magenta. Tweak is described as a reddish pink, and to me it’s that perfect fall apple/watermelony shade that’s so flattering on so many. Chased is a gorgeous lilac pink shade that has some mauve to it. One of my favorites! Katie is a very pale milky pink (the palest of all the blushes) that looks to be a hot seller. Currently sold out on Sephora.com. 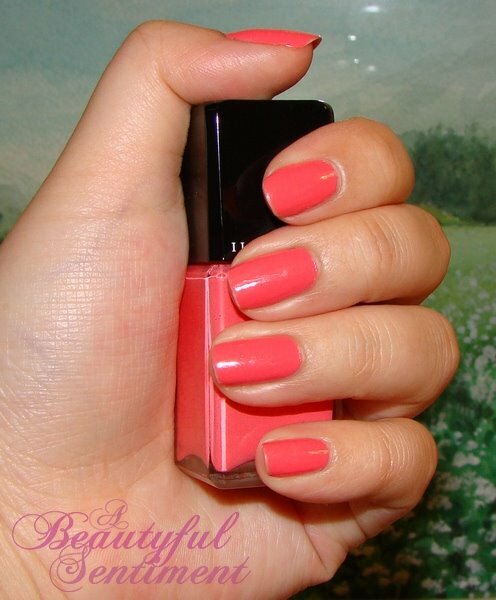 Unrequited is an amazing baby pink that gives you that barely-flushed look. Better suited for lighter skintones and another favorite of mine. Tremble is Katie’s warmer pink sister – yet another favorite of mine LOL. What can I say, these are beautiful! Lover is a vibrant apricot (it’s much much brighter than it appears in this photo and not really for the faint of heart). Hussy is again brighter than it appear to be in this photo, and it’s this beautiful bright petal pink and another favorite blush of mine. I’d love to get my hands on this one (and Chased, Unrequited & Tremble!). Excite is described as a vibrant coral, and to be honest kind of scared me in person as it looked bright orange. This isn’t something I think I’d be able to pull off – ever! Expose is a soft peach, although it’s not the kind of peach you’re thinking of. This is a true peach and matte meaning it’s got a little orange to it. Panic is a bright cherry red and something I’d go for if I did red blush. I love how clear and clean this shade looks. I was seriously shocked by just how amazing these blushes felt under my fingers. The Powder Blushers all have matte finishes and I was worried about chalkiness, but these are super super pigmented and silky smooth. They glide on like a dream and, while a little pricey, seem to be well worth the $23 they cost. I’ll definitely be adding a few to my collection, meaning you’ll be getting better swatches of at least a few shades at some point! So I’ve got some Illamasqua swatches coming for you, but please be forewarned that the photo quality/lighting is pretty terrible due to the fact that these were taken with my old Olympus – meaning these really aren’t up to my usual standards, so you’ll have to forgive me! But as Nicole pointed out, since Illamasqua isn’t available in that many Sephora stores, mediocre swatches are better than none at all! I’m currently wearing 10 diferent Illamasqua Nail Varnish shades on each of my fingers – I love their polishes so much! These were applied over the chipping Lament manicure I’d given mysel some time back, so it’s just one coat over that fluorescent shade – this should give you an idea of how amazingly opaque this polish formula is. Oh and you’ll also have to excuse the messiness – these were quick and dirty swatches done at Sephora! Phallic is an amazing shade of midnight blue with blue shimmer. It’s everything I wanted Chanel’s Blue Satin to be and more, it’s got such depth and dimension to it, even with only one coat! Jan is a fleshy pink with gray/lavender undertones and officially my new favorite neutral polish. It makes my hands look amazingly polishes and just looking at the shade makes me feel like I’ve got my act together. It’s perfection! 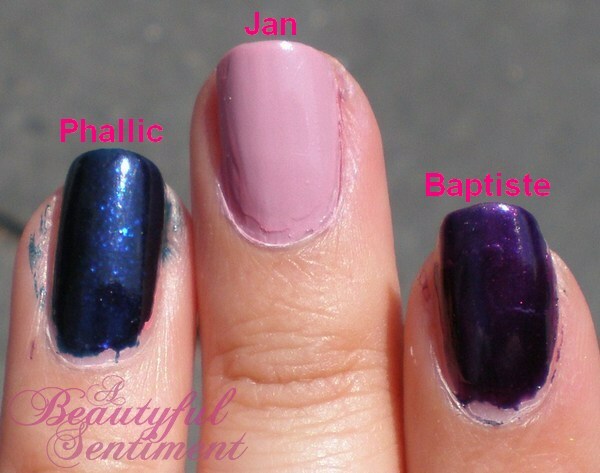 Baptiste is another stunner – a deep royal purple with purple shimmer. Like Phallic, it’s got amazing depth to it and is really gorgeous under direct light. I’ve already reviewed Lament, which is a gorgeous neon corally pink shade – click the Illamasqua label below and it should pop up. 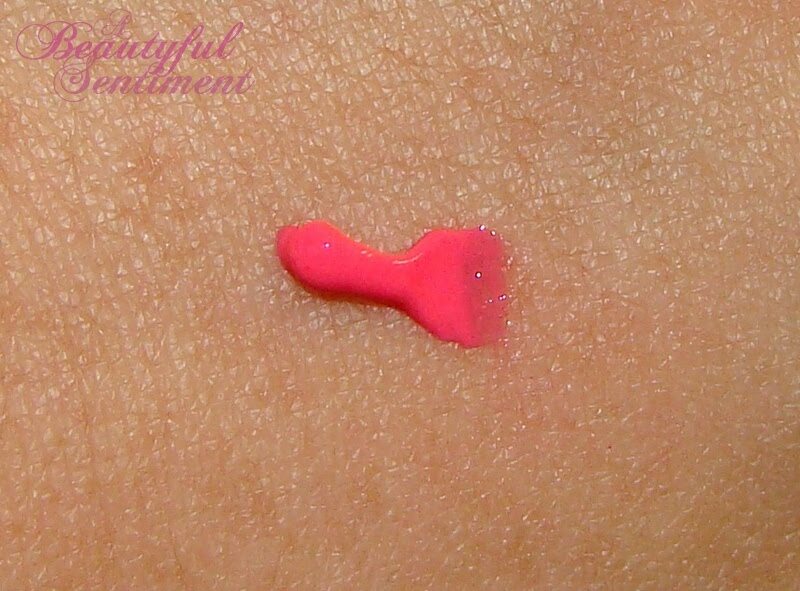 A few other shades I loved are DWS (the perfect cement gray), Loella (not terribly unique but a fun sparkly bubble gum pink) and Grab (be warned that the swatch on Sephora’s site is horribly inaccurate – it’s more of a fuchsia/magenta shade with slight purple undertones). Have you got your eye on any Illamasqua Nail Varnishes? Come out of the shadows with high-shine, color-rich Illamasqua Intense Lipgloss that offered in a wide range of bold colors. Create lips that look full and glossy—sans the stickiness—and draw attention to your lips and to you. I love to wear eye-popping shades on my eyes every now and then, but I’m rather timid when it comes to my lips. 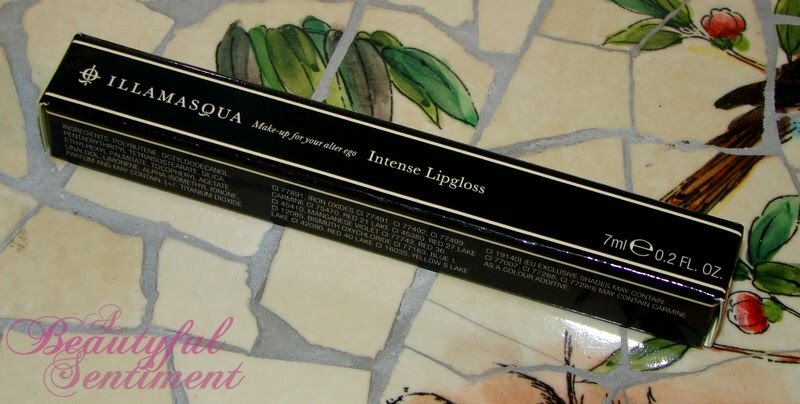 I tend to go the safe route and rarely stray from my soft nudes and pinks unless I’m going for some serious drama, so of course I was a little iffy on Illamasqua’s Intense Lipglosses. But I’m iffy no more, this was quite literally love at first swipe! Before I get into the shade itself, I just have to say a quick few words on the packaging. Illamasqua’s glosses are packaged in these uber-chic, ultra-slim minimalistic tubes that I just love for their sheer simplicity. The clear applicator tip is perfectly sized for for applying this crazy-pigmented gloss to the lips, and there isn’t a thing I can find wrong with it. 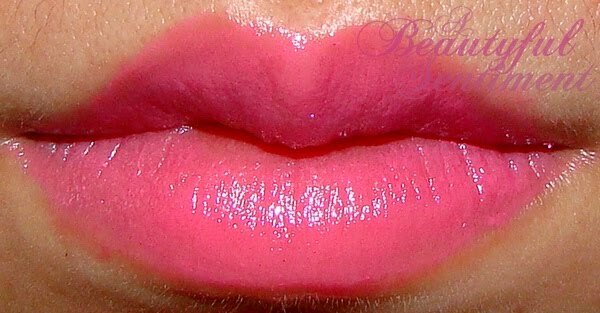 The shade Indulge is a seriously bright neon pink that needs to be used sparingly as a little goes a very long way. Illamasqua’s Intense Glosses are wonderfully creamy and intensely pigmented so you really only need a tiny blob of color to get some great color on your lips. And did I mention that these smell like Nerds candy? Yummy! This photo is what a sheer coat of Indulge looks like on my lips. 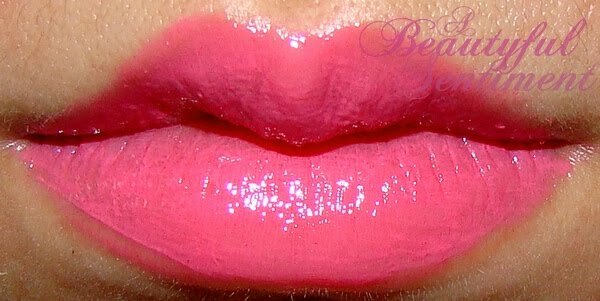 The color is less glossy and more creamy and provides the look of a pigmented lipstick with a bit of sheen. I absolutely adore this shade as I can wear it sheered out for work, or layer it on a little thicker for some eye-popping color! Here’s a lip swatch of Indulge applied as I would a normal gloss – a little more creaminess & shine and a lot more color (sorry the application is rather messy, it was dark)! Another thing I love about the Intense glosses is that, even after the creamy glossiness is long gone, your lips are let with a long-lasting stain so that you’ll never be without some sort of color. Illamasqua’s Intense Lipglosses definitely aren’t for the faint of heart, but they’re surprisingly wearable and look truly luscious on the lips. They get a thumbs up from me and I highly recommend checking them out for yourself! Leave your mark with bold, rich, vibrant colors that stand out. The formula is hard wearing and chip resistant and contains individual finishes from matte to high gloss. Apply two coats for high intensity and use with Illamasqua Nail Base Coat and Illamasqua Nail Top Coat for the perfect finish. Make a statement and talk with your hands! I was hoping that I wouldn’t love Illamasqua’s Nail Varnishes as $14 is more than I like to spend on my nailpolish, but what can I say, they’re pretty great! I picked up Lament, which is a shockingly bright, almost fluorescsent orangey/pink coral and I was so so impressed with the quality. I’m a huge klutz when it comes to applying my nailpolish, so I could really appreciate how easy the square-topper was to grip and maneuver. The formula itself is thick and quick to dry meaning you don’t have as much working time as you might with other polishes, and too many brushstrokes might leave you with a somewhat streaky finish, but I’m all for fast-drying polishes as I always manage to mess up a perfect manicure by doing things before my nails are fully dry. 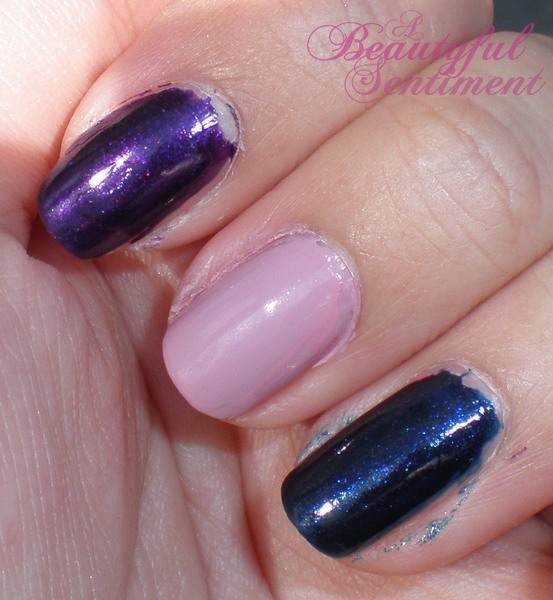 What really differentiated Illasmqua’s polishes from others I’ve tried is the opacity of the shades. I was able to achieve rich, creamy opaque coverage (Lament has no shimmer or sparkle to it but it’s wonderfully, lusciously creamy) with just one coat. I decided to go with a second coa to give them that luorescent creamsicle look and other than a little tip-wear, this polish has been wearing beautifully. I can easily see Illasmaqua’s polishes becoming a fast favorite of mine! Sephora Haul w/ TEMPTU, Illamasqua and Lots More! I know many of you have been as excited about my Sephora haul as I’ve been, so here it is at last! UPS has this terrible habit of just dumping my packages on my front porch in plain sight of the street rather than off to one side, so you can believe that I was suffering some minor anxiety wondering if this would still be there when I got home. And my bag of five samples! So per the usual I’ll be reviewing everything individually with tons of photos for you to enjoy, but I just wanted to quickly note that Illamasqua has far exceeded my expectations (which actually weren’t that high)! The nailpolish is beautifully pigmented and opaque and dries quickly to a beautiful finish. Plus the square bottle shape is really comfortable to hold when applying your polish. 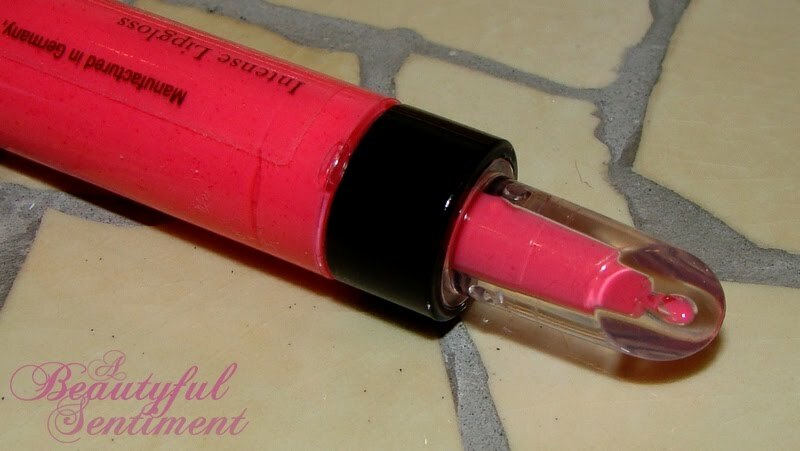 I was a little afraid to order the Intense Lipgloss as Indulge is essentially a hot neon pink, but these are seriously amazing and I’d definitely recommend checking them out. They’re super pigmented so you only need the tiniest dab, and leave a stain of color on your lips so that you have some residual color even after the gloss itself is long gone. 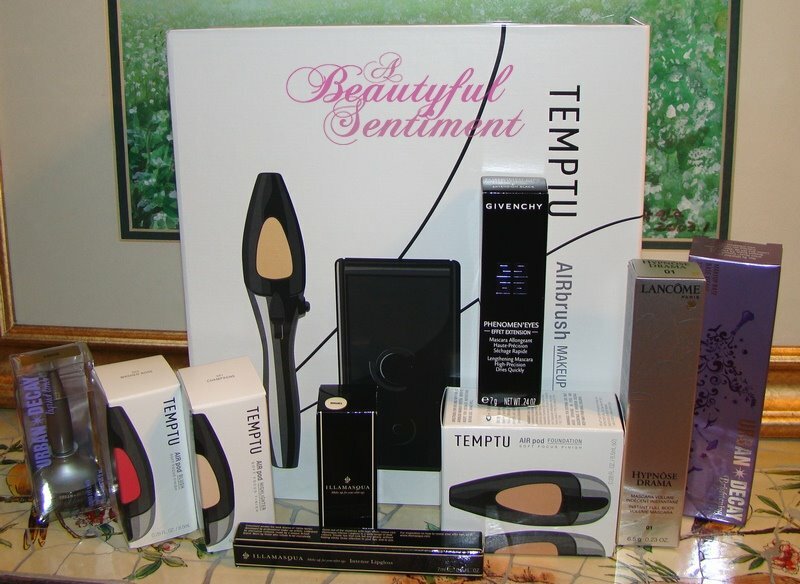 And what I know a lot of you have been waiting for — the TEMPTU stuff! 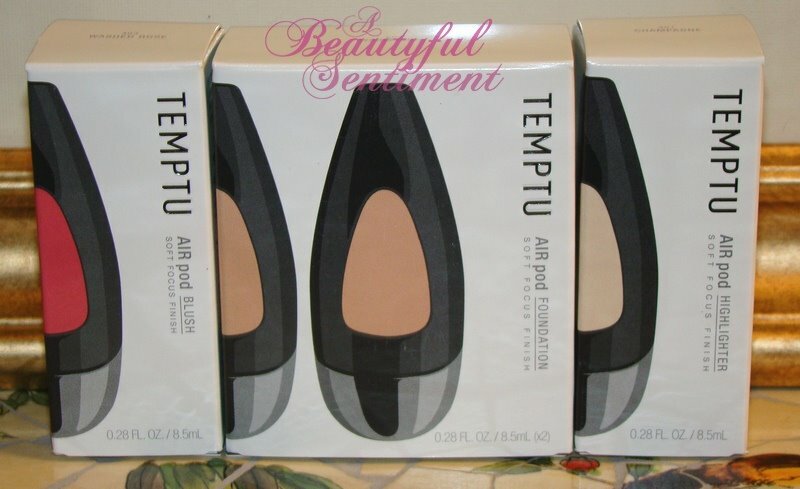 I love this photo of all the TEMPTU pods out of their boxes. From left to right you have the foundation pod, blush pod, and highlighter pod. I was running late to work this morning (had to be in by 8a.m. to get some work done but I overslept but a little) but I managed to quickly throw together the TEMPTU device because I just had to tell you at least a little something about it today, and I love it! It’s like my SK-II Air Touch Foundatin on steroids! The foundation is wearing incredibly well, and all in all I can tentatively say that I’m happy with my purchase. More details on this to come — no worries you’ll be hearing more then you probably ever wanted to about TEMPTU in the coming days! So what do you think of my Sephora haul? Have you tried any of these items for yourself? Known for their intense colors and dramatic makeup, Illamasqua is your go-to brand for nighttime makeup—whether it’s an evening out at the opera or the dance club. Conceived amidst the dark drama of Berlin in the 20s, Illamasqua was developed by professional makeup artists and launched in 2008 in the U.K. Embraced by celebs and alternative cultures alike, their colors allow you to express your most daring, boldest, and most intense sides with professional nighttime makeup that’s richly pigmented and long lasting. Are you ready to release your night-vixen alter ego? Illamasqua, touted as the UK MAC, was slated to launch online at Sephora.com sometime today, but it seems that they’re running abit behind. I’ve been waiting for this all day to place my order, but it looks as if they’re still not 100% done — the brand page is now up HERE but none of the product links are working yet. Hopefully everything will be fully operational by tomorrow morning! On a related note, this is also supposed to launch on July 31st or so at Sephora’s new flagship store in Times Square – something that’s news to me. From the quick search that I did online, this store isn’t even open yet. I’m excited for its opening though since I work in the area!